Digital Media Women, our ideas and our vision, were created in the year 2010. It was born in the moment when, once again, co-founder Carolin Neumann found herself confronted with a men-only conference on digital topics. Addressed with this obvious deficit, the organizer claimed there were no women in the field. The truth, however, is: there are many brilliant professional women in the field, he just did not know them. „We have to fix this bug!“ is what Carolin Neumann thought of when the idea for #DMW came up. Via Twitter and a blog post she shouted out for partners in crime to meet and discuss the issue. And this is how the #DMW founders and brilliant female digital leaders came together. As you see, founding #DMW has been an effort of crowdsourcing – just like it should be in a professional network of the digital media industries. It is four years now that #DMW are working as a nonprofit association. Ever since, new teams in Berlin, Munich, Cologne and the region of Rhine Main have joined. 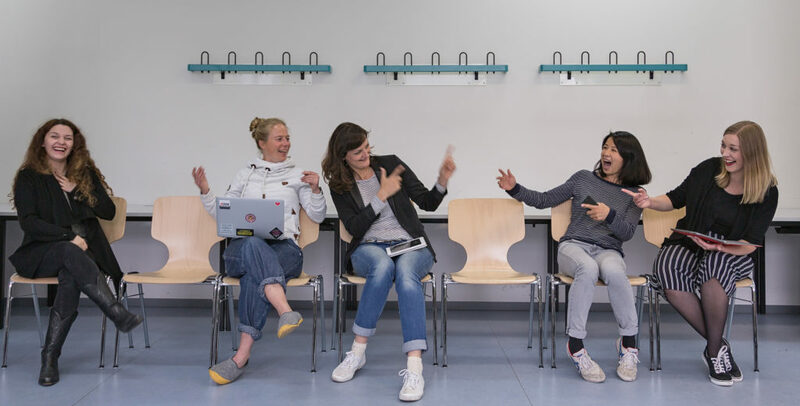 Today, almost 100 female professionals in seven German cities are contributing to gathering, connecting and increasing the visibility of women in the digital media industries. Our means are a huge virtual Facebook community with around 7.000 members, meetups, events on specific topics, and cooperations with media such as the Upload Magazine and conferences such as re:publica, Social Media Week or Video Summit Leipzig. Cooperating with Video Summit Leipzig, the first conference of this kind in Germany, is especially important to us: It is just the right platform for thorough and emotional storytelling in word and image. If you follow the most recent developments of social media tools, you understand that there is no way to avoid Snapchat as a standard platform. Youtube has risen to be the second most important search engine after Google itself. Also ourselves, the #DMW, we will be more and more using moving images to tell our stories and to create visibility for women in tech and digital media – on our website and social media channels. Our video experts Sandra Roggow and Cécile Schneider will be reporting live from Video Summit Leipzig. Not only visibilty is important to us but also to initiate real change in society when it comes to female representation: Our main goal is to be living and working in a world of equality, diversity and participation. Consequently, we have been contributing to an EU task force that has developed an extensive law supporting our goals. We do not only want to discuss about these topics but actually create change. Our motto is “Machen statt Schnacken” – a little less conversation, a little more action as Elvis put it. Digital transformation is our playing field: We consider digital change as an opportunity to change exactly these conditions of unequal visibilty. Hierarchical thinking is obsolete, long-grown structures are breaking apart. Typically female compentencies and characteristics like communication and networking skills as well as the ability to deal with diversity in teams are becoming more and more crucial on a leadership level. By the next three years, we will be able to observe a lot of changes in this respect – and this exactly where we apply the lever.